I cannot believe I never posted that I was a guest on Leah Day's podcast recently! I shared it on Facebook and then totally dropped the ball. Hopefully you've been catching these very interesting episodes hosted by Leah as she interviews people from the quilting industry and beyond. 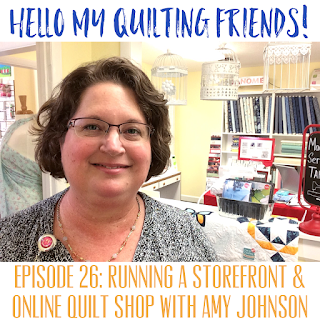 The show pulls back the curtain a bit into the business side of the quilting industry and she decided to interview me about running a "brick and click" business. Brick and click means a business that has a store front as well as an online component. Actually, she wanted to see how I balance life and work between the two businesses.....insert hysterical laughter here.........and I am not the person to talk about balance! It's a constant juggling act with balls getting dropped from time to time. I liken it to standing on a teeter totter. Ideally, you're in the middle, keeping both ends balanced. More likely, it's a dance from one side to another, a constant wiggling back and forth. It's a pretty wild and amazing ride and I think Leah did an excellent job of asking the right questions to bring out my story. Dianne, thanks so much for saying so!